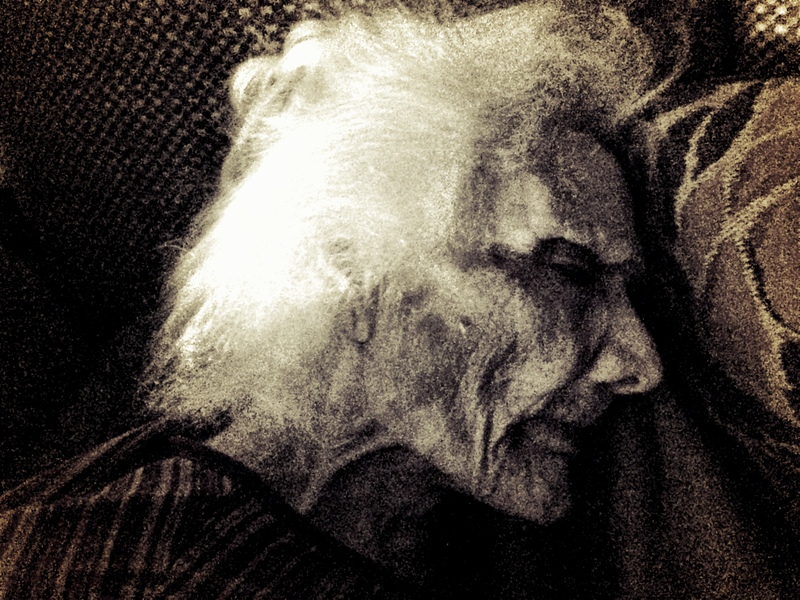 Grandma looking thin, but sleeping peacefully. I’ve heard from many of you the past few weeks, wondering about Grandma and wishing for more posts. It’s been a crazy few weeks since we moved into the new place. There have been lots of ups and downs, but overall, Grandma is ok.
Last night, for the first time, she fell down. It was 1:30am and I was awakened by a loud CRASH and shriek from Grandma. I bolted downstairs, trailing my bathrobe and calling out for her to no avail. I found her in the fetal position, on the floor next to her bed, her walker against the opposite wall. I leaned down over her and asked if she was ok. She shook her head no. I asked if she hurt anywhere, and she said she wasn’t in pain. When I asked what happened she said she fell out of bed, but I’m guessing she was moving from the couch (where she spends the bulk of her time) to her bed and she lost her balance. I had her put her arms around my neck and I lifted her up and put her on her bed. I then lay down next to her and held her hand, trying to soothe her nerves (and mine, too). After a few minutes she started getting fidgety so I asked if she needed to use the restroom. She nodded in the affirmative, so I helped her up and to the bathroom. I then got her tucked in again on the couch and went back to bed for a sleepless night. I talked with her hospice nurse this morning to let her know this new development. She was heartened to hear that Grandma wasn’t hurt, but urged me to start having conversations with Grandma about asking for help when she’s feeling unsteady. There have been a lot of ups and downs through this process and I guess I’m going to have to come to terms with the fact that this is the new normal. I’m thinking about getting a bell she can ring if she needs help in the night so we can avoid any more scary falls. This entry was posted in Caregiving on September 27, 2013 by Rob Jones. I had a similar incident with my Grandma. She fell off the couch and on to the floor. I then decided to order her a hospital bed that has railings that go up and down and we placed it in our downstairs living room near the couch and right outside my bedroom. So glad to hear you are both ok.
Glad she’s okay, dude. It’s really great that you’re taking care of her.